It is with profound sadness that I write about our dear and sweet Joel Lopez Lopez. On Friday, September 14th Joel made the 7 hour journey from Casa Noble to his remote family home in La Paz. He was happy and as always, joyful. Joel spent a wonderful next day with his family but began feeling ill in the early evening. He eventually suffered multiple seizures and succumbed just before dawn while on the very long route to the hospital. He was buried Tuesday morning, September 18th, 2018. Joel lived every moment of every day with incredible character. He was always positive, kind, and joyful. He tried to be a good influence for everyone. He was always ready to help and support anyone and nothing was ever “too much.” He never complained or gave excuses. Joel, who was about to graduate from high school , is one of eight members of the high-caliber Lopez family who have been part of H4HC. They are Nery (now a member of the National Police), German (Accountant), Ricardo (Accountant), Pedro (Agricultural Engineer), Oscar Renee (Army), Noe and William (currently in high school) and Joel. Hope for Honduran Children was deeply saddened by this tragic loss but we have chosen to live to honor Joel rather than mourn him. We often refer to the June trip as “the mixed bag”… but we have now changed that to the “Five Star Amazing Mixed Bag”… some of the 22 participants were first time service volunteers traveling alone but most were repeat volunteers… and many traveling as a family. Lisa brought two of her children ages 13 and 15, Ellen brought her college age grand daughter, Sara brought her Dad, and the youngest, Cash (age 4) brought his parents and four siblings. We spent each morning providing medical check ups and classes at our rural schools – often with the translation support team from Casa Noble. Afternoons and evenings were spent with the Casa Noble boys. With the enormous support of our John Carroll University intern, Claire McGilley, it was an awe inspiring journey for everyone! On September 6th, Hope for Honduran Children celebrated its annual “Fiesta” at the historic Dunham Tavern in downtown Cleveland. Indeed, it was a celebration to remember! The Noel Quintana band filled the starry night air with Cuban rhythms while steak, chicken, shrimp and pork tacos were served from a local food truck. Delicious gelato and café were available from another truck and inside the barn the silent auction was an enormous success. It was a true “crowd pleaser” raising much needed funding for the Casa Noble Home. Kudos to all of those who helped make it a wonderful evening – the Board of H4HC, Anne Fornari, Jean Koznarek, Nancy Nebanzahl, the Freimoth and Knapp famillies and Claire McGilley in particular. We began the year with a most exciting announcement. Carlos Aguilar (Churri) is the new Director of Casa Noble. It was a very pleasant and exciting transition for all of us. This is the first of several transitions in 2018. In addition to be our local headquarters, the Learning Center will soon house our library and English classroom. Always humming and now double in size! Located in the Santa Lucia High School, our new computer center is a result of a Rotary International grant proposed by the Ohio, Shaker Heights Rotary. Congratulations to our agricultural engineer who recently graduated from the prestigious Catacamas University. The Casa Noble boys have a new micro enterprise (decorating winter gloves) and ask for your support. The gloves are great Christmas stocking stuffers, gifts for teachers, friends and grandparents. The gift that keeps on giving and keep your fingers warm! Each pair of gloves (child or adult) is $14 (including shipping). The boys hope to purchase new shoes with their earnings!!! For more information, email Karen at kgodt@h4hc.org or telephone 216-403-1051. There is no better classroom than the greater world itself and there are no more impactful lessons than immersion into this eye-opening, loving and vibrant culture. We guarantee both a memorable and meaningful journey! Due to the overwhelming popularity of the H4HC service trips, space is limited making pre-trip registration required. March 3rd to 10th Spring Break! 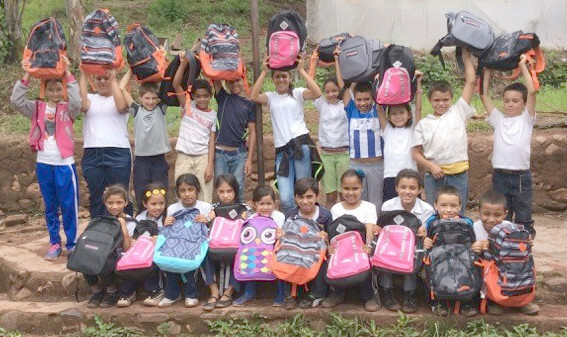 On January 31 a cohesive team of 21 volunteers arrived in Tegucigalpa to laugh and work nonstop for seven days. It was a very dedicated team, highly motivated, extremely hard working and full of joy and laughter. The boys of Casa Noble were thrilled to learn new things as well as begin the new year with both former and new friends. With the help of one volunteer, the boys enthusiastically focused on establishing the core values of the Casa Noble Home. Afternoons were spent discussing plans, making jewelry and gloves to sell, making new friends at CAIPAC (the blind center), hiking down the mountain, and of course, doing puzzles, visiting the coffee farm and the beautiful tea house! Each morning we visited the isolated rural schools such as Naguara, Suyatillo, Flor Azul, Campo, and San Juan del Rancho. At each school we were met with countless hugs and abundant gratitude. Activities included: math games, reading, physics, and field day games of face painting, bubble blowing, the parachute, spoon races, etc. Many on the team returned home on the 7th while others continued their journey visiting Copan Ruinas. We spent three days visiting the Mayan ruins, exploring every nook and cranny of the picturesque town and dining at Hacienda San Lucas. It was very special. Due to the overwhelming popularity of the H4HC service trips, space is limited making pre trip registration required. A pencil is a small thing but in the developing world it can be a child’s ticket out of poverty— the difference between getting an education and getting sent home. Hope for Honduran Children (H4HC) was founded in 2005. It all began when we were introduced to 24 abandoned children who were shoeless and had not eaten in four days. 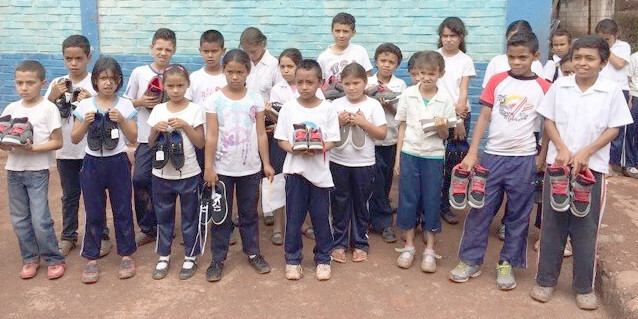 “Life would be perfect’, they said, ‘if you could help us find food, shoes and a few (11) pencils.” We continue to be desperately in need and hope that you will encourage your class or school to join the Hope for Honduran Children’s “Sister School Program” this fall. We have five rural Honduran villages that we are helping with water, healthcare, food and education…this translates to well over 1000 children. We have just returned after delivering new shoes, backpacks (many of these youngsters walk 2-1/2 hours to attend school) and supplies. During our visit we learned that in the five villages the poverty is so extreme that no one can afford soap, a toothbrush or toothpaste. Just think of the enormous impact you and your students could make on the lives of these ultra poor forgotten children. Please, don’t allow them to be ignored or forgotten any longer. Contact Hope for Honduran Children for more information on how simple and rewarding it is to brighten the lives of these children. Thank you to the 4th Grade Class of Arrowhead School in Copley, Ohio. They donated the backpacks which were filled with soap, toothbrushes, toothpaste, and school supplies.